The Terex® R165S radial lift path skid steer loader has a rated operating capacity of 1,650 lb at 50-percent tipping load (3,300 lb). Loaders engineered with a radial lift path, meaning the loader arms raise in an arc pattern, excel at digging and grading applications. This unit weighs in at 6,605 lb operating weight and achieves 116 in of lift height, as well as nearly 22 in of reach. The R165S also boasts 10.5-in ground clearance and 28.4° rear angle of departure, which improves its ability to traverse soft, uneven terrain. The R165S has a 50-hp, Perkins diesel turbocharged engine with load sensing, variable flow hydraulics — the engine and hydraulic combination on the R165S offers 8,453 lb of tractive effort. 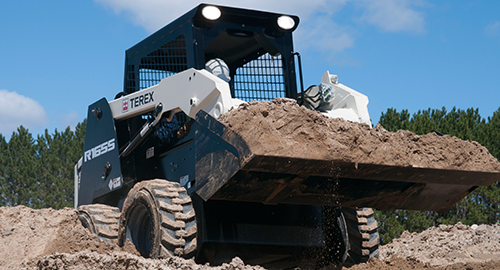 Terex skid steer loader operators are able to move more material per loader per day than other brands. The drive pumps and motors on these loaders are performance matched to provide operators with the optimum amount of hydraulic horsepower on every task. Its load-sensing hydraulics to ensure that fuel and energy are not wasted on surplus hydraulic power, so operators can push material, dig, grade and drive-through the toughest jobsite conditions, yet conserve power when requirements are less demanding. 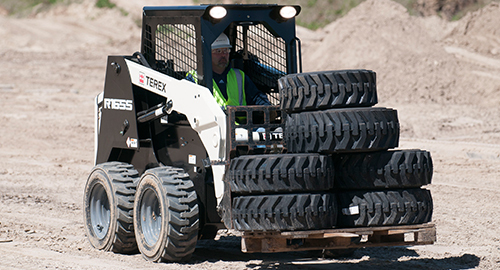 For increased versatility, the loader arms on the Terex models are designed to easily accommodate over-the-tire steel tracks, and because these loaders run cool, allowing operators to work longer in hot, humid environments. For quick cycle times, a powerful drive train with optional 2-speed transmission propels Terex skid steer loaders to the fastest top speeds in their class — up to 12 mph. 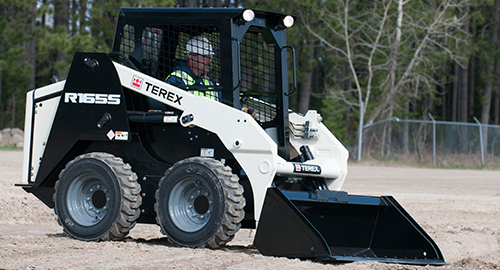 Terex skid steer loaders also offer increased fuel capacities over other brands, a 25-gal fuel tank on the R165S, that translates to longer operating times between refueling.